Description of the room: The cottage is divided into two halves and has two separate entrances. The ground floor has a large living room with a sofa and a table, a TV and a mini kitchen, and a separate toilet. On the second bedroom with a large bed and air conditioning, as well as a bedroom with two single beds. The bathroom is equipped with shower. 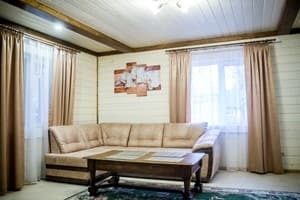 Description of the room: The two-storey cottage, which area is 140m2, is located in the middle of the forest, on the territory of the sanatorium "Podolie". 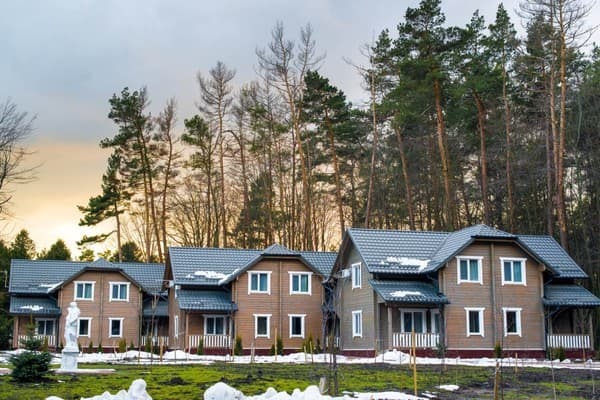 Amazing forest views and clean air will help you to have a wonderful rest. The room on the ground floor has a separate kitchen with a fridge and a kitchenette. Dining table and 4 chairs. Living room with sofa and TV, wardrobe and toilet. On the second floor there is a separate bedroom with air conditioning and a large bed. And a bedroom with two single beds. Exit to the balcony. Bathroom is equipped with shower, bath, bidet, washbasin. There are dishes, microwave, refrigerator, hairdryer, electric kettle, 2 bathrobes, 8 towels, slippers, air conditioning, TV. 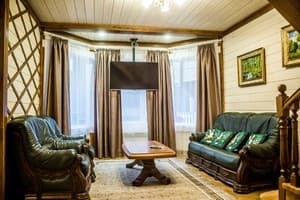 On the territory of the cottage complex there is a restaurant "Versailles", which will surprise you with modern design and exquisite food, as well as billiards and a bath. There is a hookah room and karaoke. Nearby there are shops and salons, as well as a stop for travel to the city. The cost of living for one day. 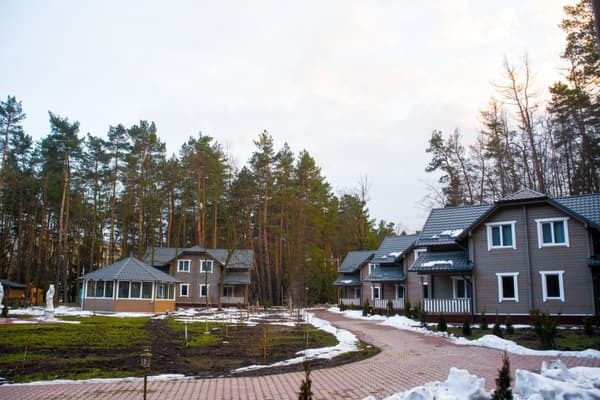 1 person 3000 2 people 1700 (each) 3 people 3400 +800 (additional) 4 people 3400 + 800 + 800 It is possible to purchase the vouchers for treatment and food in the sanatorium "Podolie" with nitase and a washbasin. Check arrival: from 08:00 - 17:00 hours. Check leaving: to 08:00 - 08:00 hours. On the territory of the cottage complex there is a restaurant "Versailles", which will surprise you with modern design and exquisite food. 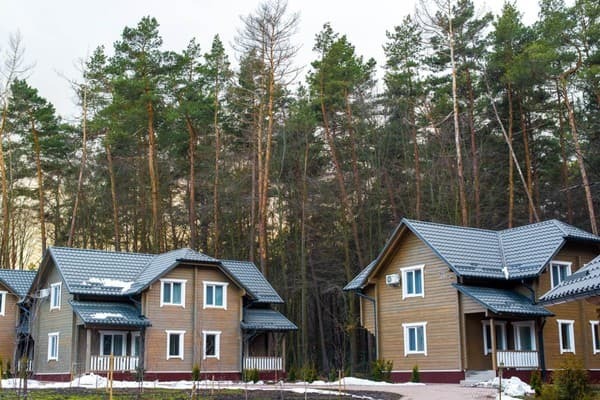 It is also possible to order food in the sanatorium "Podolie" on the 7-day menu, which is formed on the basis of the features of dietary rations for different groups of tourists. Nutrition of patients suffering from high and low acidity, with endocrine disorders, disorders of the musculoskeletal system, cardiovascular and urinary system. 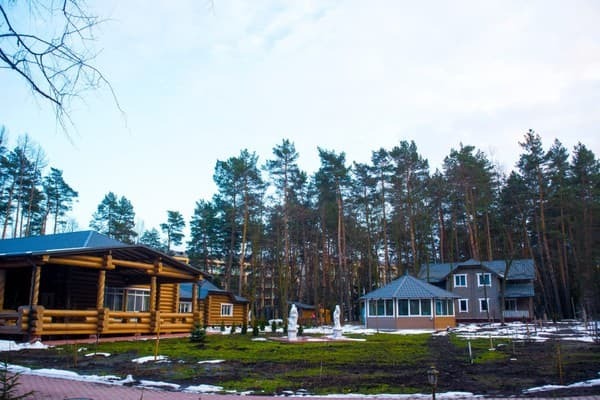 It is possible to additionally purchase a ticket (treatment and meals) in the sanatorium "Podolia". Excellent therapeutic and diagnostic base. In the sanatorium you can get the following treatment: radon therapy, mud therapy, all types of physiotherapy procedures. Underwater spinal traction in radon water, treatment in the pool of hydrokinesitherapy. 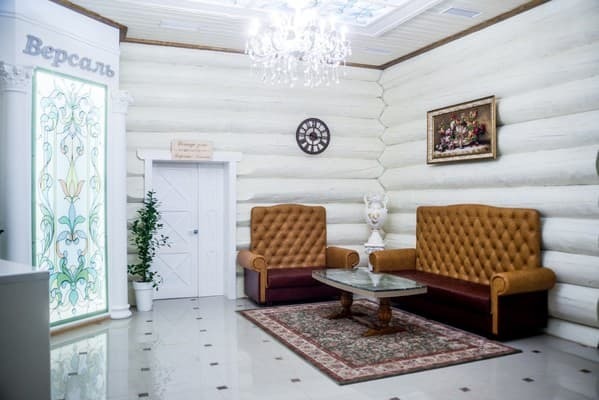 In the sanatorium there is the first in Ukraine radio-radio for the treatment of patients with diseases of the pulmonary and cardiovascular systems. A food in sanatorium "Podolie" on a 7-day menu, which is formed on the basis of the peculiarities of dietary rations for different groups of tourists. Nutrition of patients suffering from high and low acidity, with endocrine disorders, disorders of the musculoskeletal system, cardiovascular and urinary system.